Lake Bullen Merri has experienced several large fish kills in the past, which are thought to have been the result of poor water quality. These incidents were thought to have been reduced somewhat with the installation of destratification equipment in 1982. Future management of the lake came under question with the ageing of the aerator equipment. The aims of this study were primarily to review the installed and alternative aeration infrastructure, with the view to determining its effectiveness to reduce fish kill events and, secondly, to collate data on water quality of the lake. Baseline data were not acquired prior to the aeration system being placed in the lake, and as a result, the actual impact of the aerator on the lake is uncertain (Herpich 2002). Of concern is the theory that destratification of waters with high buffering capacity such as Lake Bullen Merri could cause blue-green algae dominance as a result of increased nutrients in the euphotic zone promoting further photosynthesis. Whether or not this is occurring in this particular lake is unknown. It is, however, a distinct possibility, as Nodularia spumigena is known to be the most common species within the lake. In the longer term it is not known what result the declining water level will have on water quality, although it is likely that the lake will become increasingly saline, and concentrations of non-beneficial chemicals may also result. 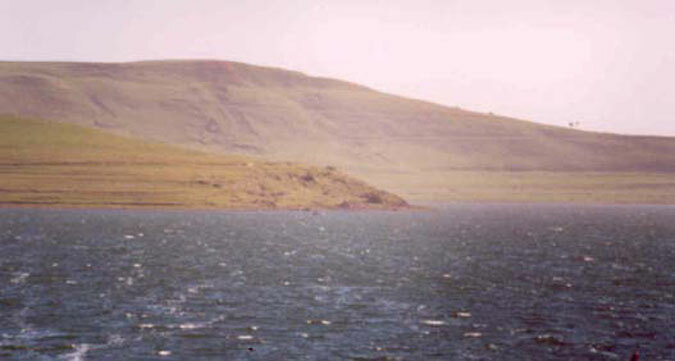 Lake Bullen Merri is 448 hectares in surface area, and 66 metres deep. It is a maar lake, and runoff from the crater walls and direct precipitation are the only sources of water to the lake (Duthie 2000). Groundwater contribution has been found to be insignificant. Timms (1976) concluded that the lake is sealed from the groundwater table. Records indicate that the water level in the lake continues to decline. Timms (1976) found that over the previous 100 years the lake had fallen 22.5 cm/yr on average. It is also increasingly saline, which is thought to be due mainly to its decrease in volume and its hydrological and morphological characteristics. Several proposed drainage schemes to increase the catchment area of the lake (thereby increasing the volume of in-flowing water and slowing the rate of water level decline) have been devised since 1978; however, all have failed due mainly to the large cost of undertaking such a scheme. If the water level continues to fall, the water quality in theory will decline to a level where it may no longer be able to support fish. Lake Bullen Merri has experienced several large fish kills in the past, which are thought to have been the result of poor water quality. This study aims primarily to review the current and alternative aeration infrastructure with a view to determining its effectiveness to reduce fish kills, and secondly, to collate data on water quality of the lake. Rogan (1983) states that between 1955 and 1983, a total of seventeen fish kills were recorded in Lake Bullen Merri. Records of similar incidences since the introduction of the aerator are at best sketchy. It is unestablished if the aerator has reduced the incidence of fish kills. Theories on the reasons why these fish kills have occurred include toxic algal blooms, aerial spraying of herbicides, heavy metal toxicity (ie copper), bacterial infections, oxygenation problems, turnover due to stratification, and toxic gases. There have been several studies on the lake to try to understand the water quality problems. The most thorough of these was undertaken between 1994 and 1997 by Herpich (2002). Circumstantial evidence indicated a herbicide (2,4 D) and high pH (ie up to 9.8) acted separately or synergistically in the fish kills. Grant and Rae (1996) concluded that the combination of high alkalinity in association with high natural primary productivity and high levels of dissolved CO2 within the lake triggers a series of chemical reactions. As a result, non-contagious ailments including biogenic decalcification and gill necrosis appear. The latter is particularly problematic in the summer as the ratio of NH4+ to NH3 is both temperature and pH dependent (ie temperature or pH increases result in increases in ammonia). Further weight was added to this theory in a study by Herpich (2002) who concluding that pH (ranging from 8.77-9.30) and high nutrient levels (particularly ammonia) are the critical factors related to the fish kills; also, under certain environmental conditions, (eg algal blooms, stratification and/or turnover) levels become elevated and increased stress is placed on the fish, thereby causing mass mortalities. Iron concentrations appear to be quite high, and as iron is a readily cycled trace metal, it could assist algal blooms (ie iron can mediate N2 fixation). A study by Williams (1992) found that major ion chemistry of the lake remains relatively constant, with Na+and Cl- always the dominant ions. High pH (regularly greater than 9), along with elevated temperature and nutrient levels, are thought to have contributed to a history of fish kills (Tunbridge et al. 1991; Hall 2003). To moderate the water quality characteristics as a direct result of stratification, an artificial aeration system was introduced to the lake in 1982. Originally the system was powered by a diesel-fuelled compressor, which had to be manually started to aerate and mix the lake. 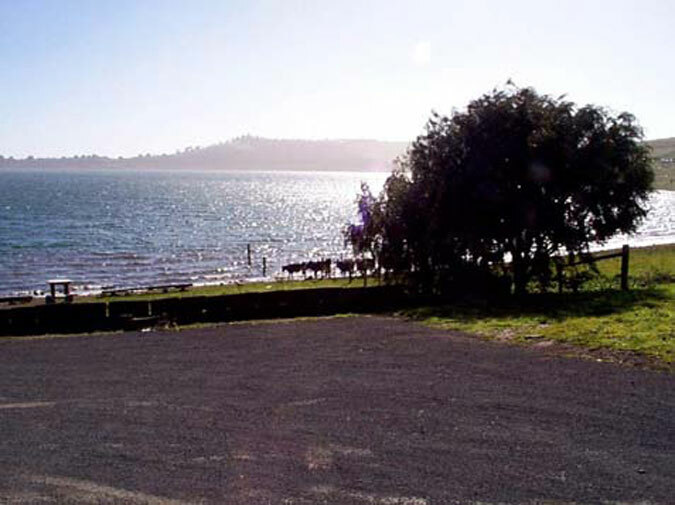 The point of aeration was situated at Cobden Bay (Figure 1) adjacent to the Camperdown Angling Club building. It was designed to operate on a 30 kW rotary screw compressor, supplying 4.75 cubic metres/minute of air and costs approximately $8000 a year to operate (Jack Gore pers comm. 2003). The depth placement of the aerator stones appears to be one of conjecture. It is, however, known that there are three stones in total, two existing at approximately 15 m, and one at greater depth (possibly 20 m or more). Originally the system operated automatically through the detection of the development of a thermocline. Once temperature differences between two probes (located on pylons at the end of the jetty) reached 0.6 °C (at 1m and 4m depth). The sensor placements created several problems due to the necessary depth spacing, the lakes declining water level, gradual siltation, and their eventual destruction by vandalism in 1993. The system became operated by visual interpretation of the lakes' state with a manual stwitch on and a timer used for automatic shutoff of the system. The length of time being determined by the operators' visual interpretation of the water quality. This type of aeration is known to be inefficient, and often requires bloom cues (ie green tinge to the water, or unpleasant smells) before operation of the system is initiated. Alternatively, as a precautionary measure, considerably more aeration is undertaken than is necessary. Several minor fish kills have been witnessed since the systems completion, although water quality in general is thought to have improved resulting in a reduction in the occurrence and severity of these incidences. 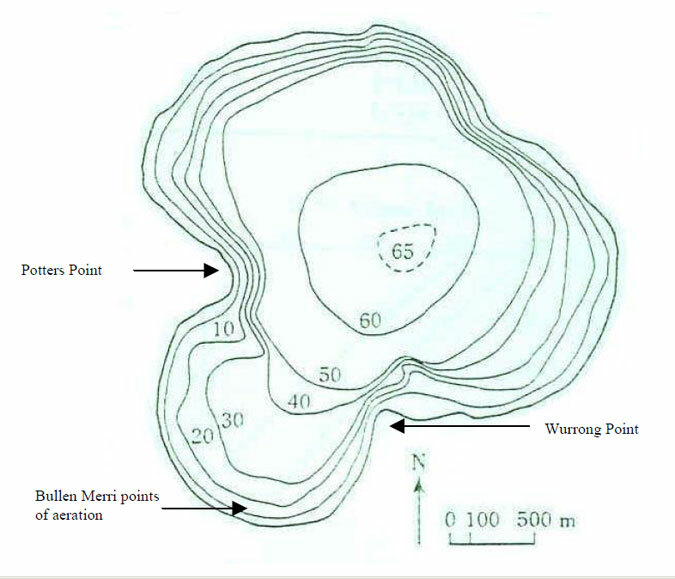 Figure 1: Location of aeration stones within Lake Bullen Merri. Expenditure on fishing trips in 1992/93 to Lake Bullen Merri was estimated at $1,039,358. However in 1993/94 it decreased to $268,473 (Morphett 2001). This fall coincided with temperature sensor vandalism, and the installation of a new air line and the replacement of the old ones (ie in 1993). A decreasing water quality and low catches of stocked fish from 1993 to 1996 were observed. It could be argued that a link exists between these incidences. There is no information available in regard to the fishery in monetary terms since that time. The only conclusion made on the efficiency of the most recent aerator was by Herpich (2002) who stated that the occurrence of episodic blooms in the lake indicated that aeration was not effective and that to improve the situation, the positioning, size and operation of the aerator all need to be re-evaluated. The system (built in 1986, and designed by Frank Burns, a civil engineering consultant for "Reservoir Water Quality Control") was considerably altered in 1993 from its original design, with an extra line added at an increased depth, and the destruction of temperature sensors as a result of vandalism. Running and maintenance costs were problematic. Of the original automated sensor setup, little exists today (see Figure 2), and what is left is corroded, outdated, and beyond repair. The efficiency of the most recent system in regard to its position within the lake is unknown (Figure 1). It appears that the location of the compressor was largely due to cost associated with power supply connection. It could be argued that the aerators (of which there are three in total, two of which are at ~15 m, the other at 20+ m) could be baffled as a result of the topography of the lake itself (ie Potters Point and Wurrong Point), and are not ideally placed. The use of natural advantages such as points centrally located and close to deep water may result in more efficient aeration/mixing of the lake overall. It should also be noted that the original engineering design only allowed for two aerators at 15 m depth, and the third deeper line that has been added since was not originally engineered for use with this system. Herpich (2002) suggests that the aeration stones may have been placed too close to the lake floor and/or the thermocline, such that upwelling of nutrients could occur. The most recent system has had an additional feeder line installed, with the third aeration stone at a greater depth than the original recommendation of 15 m. With increased depth (and number of lines) comes greater running costs, and the annual cost of running the third line at depth may be considerable. There is also some potential of inadvertently increasing nutrient levels in the surface waters due to upwelling if the third line is placed (or operated) below the thermocline/oxycline (ie if operated correctly the thermocline/oxycline should always exist below the point of aeration, and minimal nutrient upwelling will therefore result). Leakages are suspected in the aeration lines, and potential inefficiencies in the aeration devices (ie stones) due to their age, discrepancies in the depth at which they were placed, and the type of diffuser used. 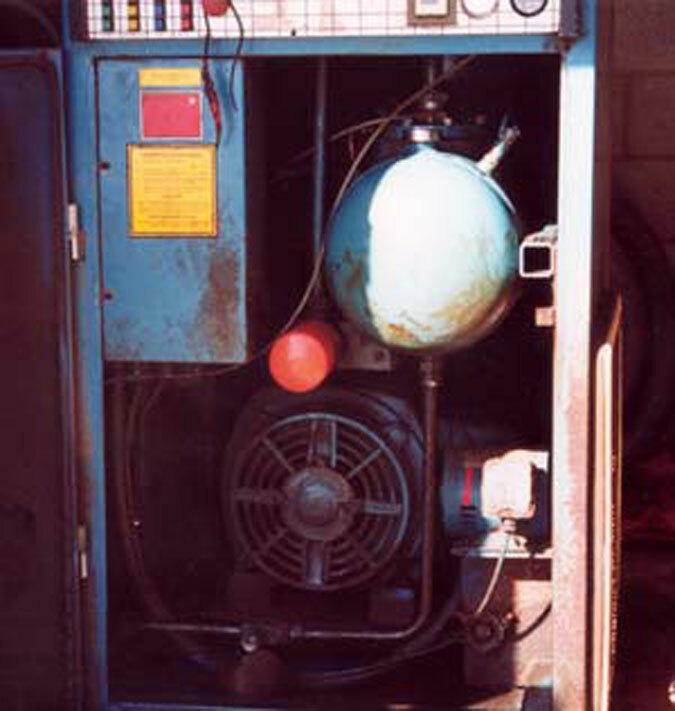 Figure 3: Most recent compressor used for aeration of Bullen Merri. The primary objective of aeration is usually to increase the level of dissolved oxygen in the system. Within Lake Bullen Merri, however, water circulation, which results in temperature/oxygen destratification, is the primary objective. This action results in a more uniform mixing of DO, a reduction of the thickness of sediments (due to the break down of organic matter), improvements in water quality, and an increase in the available habitat for aquatic animals (Anon 1989). Salmonid growth is affected once oxygen levels drop below 5-6 mg/l (ppm); the use of oxygen supplementation can increase survival and improve fish health and quality. Installing a conventional aeration system does not guarantee control of blue-green algae, and an aeration system without enough power can bring up nutrient rich water without oxygenating it (resulting in a layer of anoxic, nutrient rich water at the surface), thereby exacerbating nutrient and oxygen problems. Nitrite and nitrate concentrations have been found to be higher under continual and nightly aeration of some waters, which indicates that excessive aeration increases dependence on itself, and that accumulated nitrogenous metabolites ultimately limits fish production (Thormforde and Boyd 1991). If conditions are right (ie in this case high potential for stratification due to temperature differences in the water column), regardless of the aeration method, anoxia quickly develops if aeration is stopped, with reductions in zooplankton biomass, and increases in sediment nutrient release resulting (Gemza et al. 1995). Not all aeration/destratification projects have been successful in the past. Aeration when used for the purpose of destratification (as in Lake Bullen Merri) is designed to reduce ammonia and pH, lower surface water temperatures, create uniform mixing of DO, improve water quality, and increase the availability of habitat for aquatic animals. More than 100 different aerators are on the market in various sizes and configurations (McComas 2003), all trying to achieve oxygen transfer in various ways. The systems can be basically divided into four broad categories, including gravity, surface, turbine and diffuser aerators. Gravity aerators exist in nature as waterfalls. According to McClarney (1984) the degree of oxygenation produced by such a structure is directly proportional to the height of the fall, the volume of water dropped, and how much it is broken up in its fall. Artificial structures of this kind are produced at high costs, and a cost which increases with height. Artificial versions of this concept are powered by a submersible pump, usually placed 0.3 - 0.6 m below the surface or resting on the bottom (depending on the set-up). The outlet ends above the surface (ie in a fountain, or artificial waterfall), and any oxygenation effect is usually localised, and a result of diffusion. According to McComas (2003), fountain aerators have pumps ranging from 1/3 to 10 horsepower, with pumping rates 185 to 3100 gallons per minute, prices start ¡°at several hundred dollars¡± for the smallest unit. When the power required (or dollar cost per unit of oxygen) is taken into account, this is a very inefficient way to aerate a water body. The lake will rarely be fully circulated if it is more than 1.5 m depth. These are the most commonly used aerator systems. They work by breaking up and agitating surface water, thereby increasing the surface area of water exposed to air. They are considered the most efficient (one unit in 1000 m2) and cost effective of those available. They have little destratification capability and efficiency falls rapidly after 1.5-2 m in depth. The use of such a system on a large scale would be costly and create large logistical problems, apart from having very little benefit deeper than 2 m.
These are designed for waters 1-5 m deep, and have an efficiency similar to surface aerators. The use of 6 units/HA is recommended (ie in water less than 5 m deep). In shallow water, erosion of substrate can be a problem due to the current created by them. In addition, currents may be strong enough to interfere with the swimming behaviour of fish, and they may be a possible cause of injury (McClarney 1984). As with surface aerators, the use of such a system on a large scale would be costly and create large logistical problems associated with power supply, numbers of aerators required, and little benefit below 5 m.
This is the type of aerator used most recently in Lake Bullen Merri. It is the most common type of aeration used (McComas 2003). It uses a number of air diffusers scattered within a lake, with the air being driven by a pump (ie diesel /petrol pump, electric compressor, wind mill, or solar power) or compressed air. More sophisticated diffusers include aspirators and injectors which mix air and water under varying amounts of pressure (McClarney 1984). The more sophisticated the system, however, the greater the original outlay and the greater the operating costs. According to Geney (1994), diffused aeration has been applied to many lakes and reservoirs to address the impacts of low dissolved oxygen, by destratifying the water body to avoid hypolimnetic anoxia. Geney (1994) states that previous studies have found that in over 50% of such projects, an inadequate amount of energy had been put into the water body to properly mix and aerate them, resulting in no improvement or a negative result. Increase in zooplankton numbers resulting in an increased consumption of algal cells. The size of the "air stone"
The time the bubble spends between its release and arrival at the surface ¡ª this can be increased by providing structures which detain bubbles (McClarney 1984). An airflow rate of 9.2 cubic metres per minute per square kilometre is recommended. This form of aeration regularly comes in as the most expensive due to the large draw of power that the system requires. It is, however, the best means of aerating any system with depth due to the physical drawbacks of the alternatives. There has been some work into the use of alternative power sources that may run such a system. They are relatively costly and impractical in such a large system due to the large numbers of either solar or wind utilising devices needed to produce a comparable (and reliable) result to that supplied by electric mains. Wind and solar powered aerators are only suitable for small lakes, with installation costs being relatively high in comparison to other methods. The clearing of dense vegetation from Lake Bullen Merri's foreshores has produced exposed, bare hills (Figure 4), and several associated problems, including erosion, land slips and sedimentation. According to Herpich (2002) high nitrogen concentrations can mainly be attributed to (apart from geology) nitrogen fixation by Nodularia spumigenan; some land use practices may add to the problem. The presence or absence of ammonia is determined by oxygen concentrations (ie a decrease in oxygen produces an increase in ammonia). The first and most obvious step toward protection and restoration of a lake is to divert or treat excess nutrient, organic, and silt loads (Mandaville 1997b). This, in part, is being accomplished due to a large-scale revegetation project commencing in 1997 on the northern and eastern banks of the lake. Much of the crater is, however, devoid of cover (Figure 4) and grazed by cattle throughout the year (Figure 5). It has been suggested that slopes of >10% may not be suitable for buffer strips as runoff runs too fast through it. The more preferred option is to produce contour strips vegetated with trees and grasses (Herpich 2002). Future negotiations with private landowners for the expansion of this program need to be considered, if long term benefits to the system are to be realised through this strategy. Phosphorous concentrations have increased in the long term within the lake. Duthie (2000) found that this increase has been gradual (ie over the last 500 years), and that phosphorous concentrations within the lake have reached similar levels to modern day between 2500 and 3500 years ago. Current levels should not be attributed in total to European settlement and subsequent clearing and land use of the crater. It cannot be completely ruled out, however, that these land use practices may have incrementally altered the natural rate of eutrophication (Duthie 2000). It must be noted that phosphorous levels are comparably low in the lake (ie mean of 0.04 mg/L; Herpich 2002) and nitrogen in its organic form which is unavailable to most organisms, is thought to be more of a problem due to bluegreen algae fixation. On current evidence, it cannot be stated that large-scale bioscaping projects will solve the situation. Such projects will, however, assist in reducing nutrient inputs and the rate of eutrophication of the lake in the long term, thereby reducing possible future occurrences of toxic algal outbreaks and long term nutrient increases. Reducing anoxic conditions within the lake reduces the release of ammonia (and possibly iron) to the system (from substrates) which is suspected to have been a major contributor to fish kills. In addition, such aeration (if done correctly) results in lower surface temperatures and increased water movement that can reduce the possibility of cyanobacteria blooms. If done incorrectly, however, it is likely to increase algal blooms by the upwelling of nutrients and anoxic water thereby exacerbating the problems in Lake Bullen Merri. Figure 4: View from the Bullen Merri boat ramp, looking towards Potters point. Figure 5: Stock access on Lake Bullen Merri's foreshore. Water quality appears only to become problematic once a thermocline is present in the summer months. This causes a multitude of chemical reactions due to the cycling of chemicals and physical changes, thereby increasing stress on the fish species in the system. It is apparent that much of the knowledge needed to inform decisions to manage the system is lacking. Further studies (particularly relating to internal nutrient cycling) would need to be completed if it were to be better understood. It appears from the evidence available that the aeration system in Lake Bullen Merri is not halting fish kills, which seem to appear regularly within the lake. As the chemical composition of the system is quite stable over the long-term with minimal input from external sources (and therefore changes in the chemical make-up of the system), the water quality characteristics appear to be internal. Alternate technology to that applied in the system is too expensive for such an expanse of water at present. There is some question whether the recent aeration system is the most efficient of its type due to its age and mechanical condition. The importance of restoration work involving buffer strips and the planting of native trees should be considered as a supplementary and preventative measure to reducing long-term inputs into the system. In the longer term, it is not known what result the ever declining water level will have on water quality. It is likely that the lake will become increasingly saline, and concentrations of nonbeneficial chemicals may also result. I would like to thank Wayne Fulton, Paul Brown and Peter Grant for their comments and editorial advice in writing this report. Thankyou also to Craig Murdoch for locating several historical files on the lake. I would also like to express my gratitude to Kevin Plowman and Jack Gore for their invaluable knowledge of the aeration system and its operation. Anon (1989). Aeration and circulation for effective aquaculture pond management. Aquacultural Engineering. 8. 349-355. Bowles, B.A., Powling, I.J., & Burns, F. L. (1979). Effects of water quality of artificial aeration and destratification of Tarago Reservoir. Australian Water Resources Council, Tech. Paper No. 46. Duthie, T. (2000). Nutrients in Pirron Yallock Creek, southwestern Victoria ¨C palaeolimnological and management considerations. Master of Science Thesis. School of Ecology and Environment, Deakin University, Warrnambool. Gemza, A., Bachmann, R.W., Jones, J.R., Peters, R.H., Soballe, D.M. (eds). Some practical aspects of whole lake mixing and hypolimnetic oxygenation ¨C ecological impacts of aeration on lakes and reservoirs in southern Ontario. Lake and Reservoir management. Vol. 11, no. 2, pp. 141-142. Hall, K. (2003). Lake Bullen Merri Fisheries Assessment -DNRE South West Region, 20022003. Marine and Freshwater Resources Institute, Freshwater Fisheries Report No. 03/7. Herpich, M.A. (2002). The Nutrient and Phytoplankton Status of Lakes Purrumbete and Bullen Merri, Western Victoria. Doctor of Philosophy Thesis. School of Ecology and Environment, Deakin University, Warrnambool. Mandaville, S.M. (1997). Lake Restoration/Management. Soil & Water Conservation Society of Metro Halifax. Mandaville, S.M. (1997b). Biological Controls-specifically Biomanipulation. Soil & Water Conservation Society of Metro Halifax. Mayo, R.D. (1976) A technical and economic review of the use of reconditioned water in aquaculture. In: Pillay, T.V.R. & Dill, Wm.A. (Ed). Advances in Aquaculture. Page Bros Ltd. Norwich, Britain. 508-520. McClarney, W. (1984). The freshwater aquaculture book. Hartley & Marks, Vancouver. McComas, S. (2003). Lake and pond management. Lewis publishers. Florida. Powling, J. & Coolds, B. (1975). In: Restore Bullen Merri Committee report (1978). Stickney R.R (Ed) (2000). Encyclopedia of aquaculture. John Wiley & Sons, Inc. New York. Thomforde, H.W. & Boyd, C.W. (1991). Effects of aeration on water quality and channel Catfish production. The Israeli Journal of Aquaculture. 43(1), 3-26. Timms, B.V. (1976). A comparative study of the limnology of three maar lakes in western Victoria. Monash University. Melbourne, Victoria. Tunbridge, B.R., Rogan, P.L. and C.A. Barnham (1991) A guide to the inland angling waters of Victoria, fourth edn. Department of Conservation and Environment, Melbourne.